Our private bus will be waiting outside to take us to the Conrad Hilton hotel. The day will be drawing to a close by the time we do all of the above and reach the hotel. And everyone will be tired from the long flight over. So we will get settled into our rooms, have an early dinner, and enjoy a good night’s sleep. We begin our first full day in Egypt with a tour of the Egyptian Archaeological Museum. In addition to savoring the museum’s fabulous collection, this will serve as a good overview of ancient Egyptian history and preview of attractions ahead. The Mummy Room is always a highlight. After spending the morning in the museum, we will have lunch at the Le Pacha Floating Restaurant and proceed from there to the oldest part of Cairo—the center of the city during Roman and Coptic times. Historic structures include St. Serges Coptic Church and the Ben Ezra Synagogue. Today we concentrate on ancient Egypt, beginning with the three great pyramids, the Sphinx, and the Solar Boat Museum at Giza. And for all of those “up for it,” a camel ride. 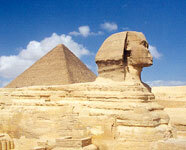 We will have lunch at Le Meridien Pyramids Hotel (El-Shams Restaurant) within view of the pyramids. After lunch we drive south to the site of ancient Memphis—none of the ancient city to be seen, but it location marked by a colossal stature of Ramesses II. Finally, to round out the day, we drive to Sakkara to see its famous Step Pyramid. Today we turn our attention to Islamic Cairo, visiting architectural monuments that represent different periods Islamic history. These include the Ibn Touloun Mosque from the Abbassid caliphate (9th century), the Citadel built by Saladin (12th century), the Sultan Hassan Mosque from the Mamluk era (13th-15th centuries), and the famous Alabaster Mosque built by Mohamed Ali early in the 19th century. Our lunch will be at the Naguib Mahfouz Restaurant in the Khan el-Khalili Bazaar, leaving time for shopping in the bazaar before returning to our hotel. Having explored Cairo through its various historical phases, from the time of the ancient pharaohs to the present-day bustling city, we take a morning flight to Luxor, far up-stream in Upper Egypt. We will arrive there in the late morning and go directly to the Sonesta St George Hotel. This historic hotel is centrally located, next to the Luxor Temple, and it will be our home for the next two nights. We have lunch at the hotel (Sonesta St. George) and the early afternoon free for rest, Late afternoon, in the cool of the day, we gather again for a visit to the Luxor Temple and the Luxor Museum. 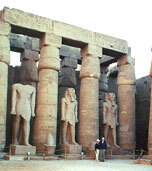 Present-day Luxor, situated on the east bank of the Nile, is the descendant of ancient Thebes. 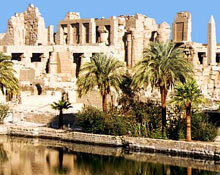 And the modern town surrounds Egypt’s two most imposing ancient temples: the Luxor Temple and the Great Karnak Temple. The pharaohs and noblemen who ruled Thebes and built these temples, along with many other monuments, were buried in underground tombs on the opposite (west bank) side of the Nile. Also they built mortuary temples on that side. So we visit the west bank today, concentrating on the Valley of the Kings where the pharaohs were buried. King Tut’s tomb is included. Also we will visit one of the nobles’ tombs (Nakht), Deir El Medinet (village of the workers who prepared the tombs and mortuary temples), and the Ramesseum (Ramesses II’s mortuary temple). Return to the Sonesta St. George for dinner and overnight . After breakfast we leave the Sonesta St. George and board the MS Philae Oberoi. This will be our floating home for the next five days and nights. We enjoy lunch on board and then set sail downstream for Qena. The whole upper deck of the Philae Oberoi is a sundeck, ideal for viewing the beauty of the Nile, observing rural life along its banks, experiencing spectacular sunsets, and circling deck chairs around Max to hear about the ancient Egyptians. There will be afternoon tea on board every day in good British fashion, and fabulous meals. Tonight we dock in Qena, in place for a visit to the exquisite Temple of Dendura the next morning. The Temple of Dendura is an unusually well preserved architectural monument dedicated to Hathor and the Hathor-Horus-Ihy triad. Actually the building we see dates from Ptolemaic-Roman times, but it replaced a much older temple that occupied the same site. Dendura is not far from Qena, but far enough that we will reach it by bus. Then we return to the Philae Oberoi for lunch and sail back to Luxor during the afternoon. Our highlight for today is truly one of the most spectacular and historically important monuments from ancient Egypt—the grand Karnak Temple dedicated to the god Amun. Pharaoh after pharaoh added to it, each trying to outdo his/her predecessors. And the inscriptions they left on the temple walls render it one of the most important sources of historical information about ancient Egypt. But first we will enjoy a late breakfast and leisurely morning on deck. Or some may want to do some shopping in Luxor before lunch. We will visit the temple in the afternoon. It will have been obvious during our earlier visit to the west bank of the Nile that one day was not enough even for the highlights on that side . So this morning we make a second visit, concentrating this time on the Valley of the Queens, Hatshepsut’s Temple, Medinet Habu and the so-called Colossi of Memnon. Returning to the Oberoi in time for lunch, we set out again, this time for a leisurely journey up-stream. Tonight we dock at Esna. Continuing upstream, enjoying the scenery, and noting how it changes gradually the further south we go, we reach Edfu by late morning. Edfu is the home of an imposing temple dedicated to Horus and the Horus-Hathor-Ihy triad—a companion temple, in other words, to the Dendura temple visited earlier in the tour (dedicated to Hathor and the Horus-Hathor-Ihy triad). We take horse carriages from the dock through the town of Edfu to reach the temple, an experience in itself. Later we return by the same means and continue our cruise upstream to Kom Ombo, home of another spectacular temple. Actually Kom Ombo consists of two mirror-image temples, side-by-side and dedicated to separate gods—Sobek and Horus. The Kom Ombo Temple is situated at the very edge of the Nile, so we can walk there from our cruise ship. Dress Egyptian for dinner tonight—in Galabiya. (There will have been plenty of opportunities to buy this very inexpensive traditional Egyptian dress). Dancing and a special party atmosphere on board tonight. This morning we continue our sail upstream to Aswan. There are six cataracts along the Nile. These are rocky places with occasional waterfalls that impede traffic. Aswan is situated at the first cataract (counting from north to south), and in ancient times represented the gateway from Egypt proper to the Egyptian-Nubian frontier. Two dams have been constructed at this First Cataract in modern times. The first one, called now the “Old Dam,” was built by the British in 1898-1902. The other one, called the “High Dam,” was completed in 1971 under Nassar’s administration. The water backed up behind the High Dam forms Lake Nassar. We will arrive in Aswan approximately mid-day, leaving the afternoon for visits to the Old Dam, the High Dam, the famous Aswan quarry with its unfinished Obelisk, and, as the sun begins to set, the historic Philae Temple. Realizing that the waters of Lake Nassar would flood the original island site of the Philae Temple, archaeologists moved the temple, stone by stone, and reconstructed on another island above the new waterline. We will reach the new site in small boats. We say good-bye to our cruise vessel this morning and transfer to the Movenpick Aswan Hotel on Elephantine Island for another night before leaving Aswan. Elephantine Island is one of two islands in the middle of the Nile across from Aswan, and this will give us more time to see Aswan, beginning with a felucca ride to the Botanical Garden on the other Island, Kitchener’s Island. Also not to be missed before leaving Aswan is the Nubian Museum. We will visit that in the late-afternoon early-evening and return to our hotel for dinner and overnight. This will be a tiring day, but perhaps the most memorable of the trip. We take an early morning flight along Lake Nassar to Abu Simbel. Now we are deep in the land of Nubia and not far from the present-day Sudanese border. Abu Simbel is the site of two magnificent temples built by Ramesses II, one for himself and the other for his wife Nefertari. Both temples were dug into cliffs over-looking the Nile near the second cataract. Both would have been covered by the waters of Lake Nassar. And both were moved to higher ground. Indeed, of all the engineering feats involved in saving monuments from Lake Nassar, the Abu Simbel operation surely was the most impressive. 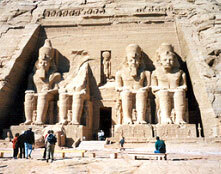 We land at the small Abu Simbel airport, bus to see the temples, return to the airport, and fly back to Cairo. Dinner together tonight. Overnight at the Holiday Inn City Star Hotel. Day 15 - Last day in Cairo and evening flight back to the U.S.
We have come now to the last day of our Egyptian adventure. Nothing is scheduled between breakfast and dinner at the hotel. The day is yours to finish with last minute shopping, pack your bags, and rest up for the flight home.